I love the idea that we can be everything and nothing at the same time, and that the infinitely large and the infinitely small are practically the same. 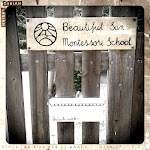 I've been checking out the blog and Beautiful Sun Montessori school in Aruba and I'm a big fan! I think that the work you're doing is amazing and will follow along online. I love this Sagan video and we've been using it over the last couple years, I think it brings about dozens of questions and ideas almost instantly.